I have never been to that part of Alaska but I am so excited to hear about it! 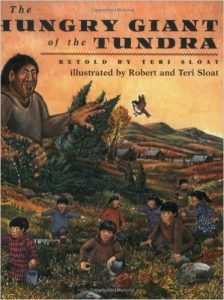 If you think this story is relevant and a good one to teach, I will incorporate it into my classroom this year in Sitka. Thanks for your local insight! I will have to read this one and look into bringing into class this year. I find the small beings like the “chickadee” keep popping up in a lot stories. It would be great to explore this archetype throughout the other regions of Alaska and ask what lessons can be gleaned from the wee creatures like chickadees, mice and shrews. Thank you for sharing this post Jimmy. I enjoyed reading your review and would like to read it. This fable teaches children to obey their parents and respect the calling to come home. It would be wonderful to incorporate children’s literature into your lessons. That is if you find a way to tie it into your discipline. It’s like Hansel and Gretel! Cool! I like that you reviewed this story and that you found a way to relate it to place based/culturally relevant learning. I also appreciate that you were able to find appreciation for the book being a person of that culture. That is something that I struggle with when reading stories that are based on traditional Tlingit stories that have been published by people that are not culturally Tlingit. I am not always sure that people from outside of the culture will get the story or the purpose of the story correct. I really appreciate you connecting the story to your understanding and ownership of your culture. I think that although there may be a lot of children’s books with the “same” theme, the way they apply uniquely to different cultures is important to address. Some of the most powerful stories or experiences for me was when I would weep looking at children’s books that I found to be relevant to my life. I think it is awesome that you want to bring this into your secondary classrooms!